﻿ This holiday season, we’ve partnered with Veronica Culver, Founder at The Enchanted Cook. Veronica is a Bulletproof® Ambassador and a food and fitness blogger who is always looking to optimize her daily life. 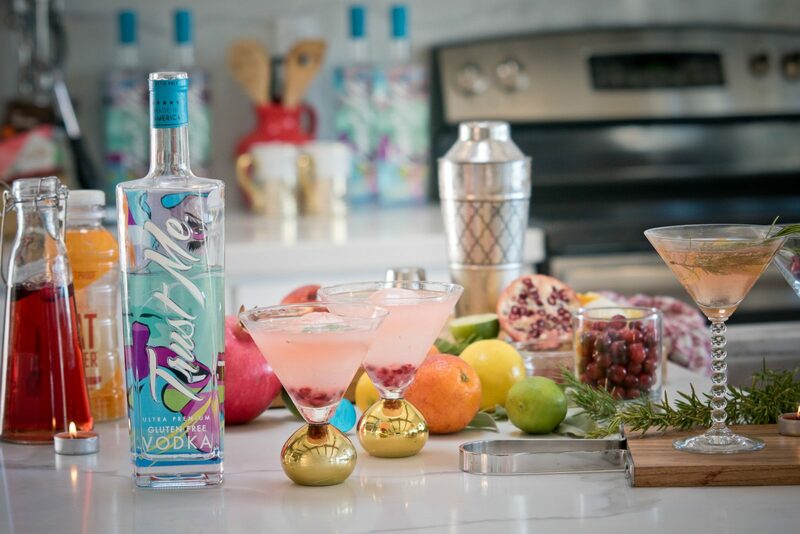 This week Veronica created several holiday-themed vodka cocktails that are also Bulletproof Diet friendly so you can stay on plan and hopefully hangover free throughout the holidays. Drinking alcohol is not technically “Bulletproof”, however if you are going to drink, you’ll want to minimize the negative effects you get from a typical cocktail that is most likely a sugar/carb/gluten bomb – a recipe for hangovers and weight gain. You might also want to leverage this alcohol guide published by Bulletproof. I personally swear by their Bulletproof Coconut Charcoal and always carry it with me. The first recipe is this White Sage Elixir Martini. It’s mildly sweet despite not having any added sugar – thanks to the addition of Bulletproof FATWater infused with B vitamins and Brain Octane. The blood orange falls in the “suspect” or yellow zone of the Bulletproof Diet Roadmap. There is only a small amount (juice of 1/2 an orange, or approximately 1 ounce) in this drink however, please be aware in case you are sensitive to oranges. The fresh sage adds a dimension that doesn’t overpower yet is noticeable in just the right way. And let’s face it, this cocktail is stunning to look at. Impress your friends with this craft cocktail that is actually very easy to make. Fancy ice cube optional. White Sage Elixir Martini makes one cocktail 2 oz. Trust Me Gluten Free Vodka ½ of a blood orange, freshly squeezed (or 1/2 of a medium size orange, if blood oranges aren’t in season) ½ of a lime, freshly squeezed Bulletproof Mango FATWater (or your favorite FATWater flavor) to top it off leaf of fresh white sage (or regular sage) pomegranate arils/seeds (optional) Fill a cocktail shaker half full of ice and add Trust Me Gluten Free Vodka, blood orange juice and lime juice. Shake well, then strain into an ice-filled rocks glass that has been rimmed with fresh sage (just rub the rim of the glass with the sage). Smack the sage between your palms to release more of its aromatic oils, then place the leaf in the cocktail. Top off with FATWater. FATWater is delicious and adds just the right amount of sweetness to this cocktail without adding any sugar. It’s also infused with Brain Octane oil and B vitamins to help keep you hydrated and hangover free. Optional: Add a teaspoon or so of pomegranate arils to the cocktail for a splash of red color. You may also consume the arils which are a source of vitamins, like vitamin K and C, and polyphenols. Optional: For an extra special presentation, use a fancy ice cube like the round one pictured and float the sage leaf on top before serving.